This is Saul Goodman’s masterpiece of Body Work. Friday 14th July 2-9pm, Sat 15th & 16th July 10am -5pm. £530, £150 non-refundable/non-tranferable deposit. £265 for repeat students. Early Bird payment £475 in full by 15th February. 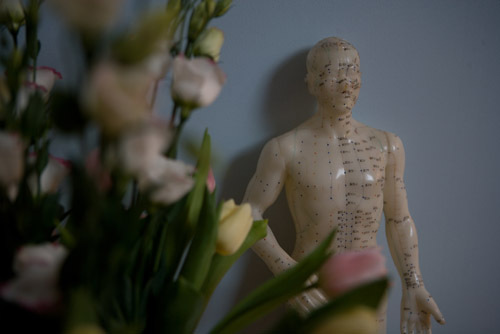 For me the masterpiece of Shiatsu Shin Tai is the Central Channel training because it is the most effective and the most elusive in which to excel. All our classes include Proprioceptive exercises to enhance our awareness in our own bodies and to improve our sensitivity to the condition of our receivers. I find these exercise give me confidence in what I’m feeling and sensing in my client. This is very helpful for Central Channel work. Also the more CC work you receive in class, the clearer your nervous system becomes which allows you to process the information presented more easily. There are six stages or patterns of stress (see below the form for details) that we learn in The Central Channel and they all have a correspondence to the attachments of the meninges and the relationship between the parasympathetic and sympathetic nerves. The touch is very light and non-intrusive. 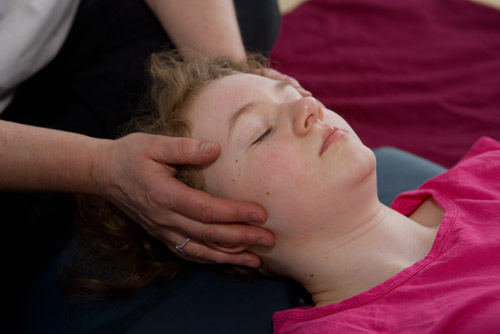 As the receiver’s energy system starts to relax and open, the giver takes their hands off to let the body process the contact before going to treat the next stress pattern that is emerging. There are clear signs and patterns that we can see and feel in the body to identify each stage. Stage 1 is Stuck in the Past. The occiput is the main area of contact which is interesting as it is the origin, along with the sacrum, of the GV channel. In the foetus it’s the beginning of the spinal column forming. Stage 2 is Fear of the Future and involves the Atlas, Cervical 1, C4, 5 6. The origin of this stage is Osteopathic and how the occiput and C1 and C5 interact using a head turning test. Stage 3 is about Identity and Sexuality. The areas of contact are around the pelvis and thigh. Stage 4 relates to our Beliefs and how we relate to the world. C2, the axis, and C3 are treated. Stage 5 is Integration and Synthesis of the all the other stages and involves several contacts at the neck and sacral areas. Stage 6 treats the Structure with soft tissue releases of the spine, pelvis and cranium. 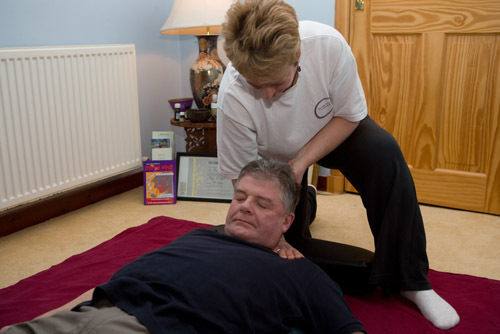 This is often an area which is overlooked by Shiatsu practitioners and can have a profound effect on the body when integrated with energy work. 20% discount on first 2 treatments for members of Waverley Tennis Academy, Edinburgh.